Finally, December 2014 is just around the corner and with that comes another year end. The last quarter of the year 2014 saw some remarkable launches and some not so. However, one thing that stood out was that the handset manufacturing were pushing the limits and some handsets were launched with high-end features with a price tag as low as INR 5,999. Features like a large display, Quad-core processor, good camera and commendable performance has been placed within the reach of Indian masses. Initiatives like Android One and manufacturers like Micromax, Karbonn, Intex, Spice among others have made it really easy for common Indian mass. This has given us a glimpse as to what the year 2015 might bring along with it, in terms of specifications of the handsets. This article is a roundup of a survey conducted on smartphone trends of last two years, which reveals what 2015 might be like in handsets domain. The size of the screen is one of the major decisive factors while buying a handset. Over the years, the screen size has been gradually increasing with every passing year and today we even have a 6-inch display on a smartphone. The initial craze of having a very large display has gradually shifted to the notion of having a smartphone that has a big display yet comfortable to hold. This is the reason behind the popularity of 5-inch display, which donned 28.30% smartphones in 2013, 29.17% in 2014 and is expected to have a share of 35.17% in 2015. 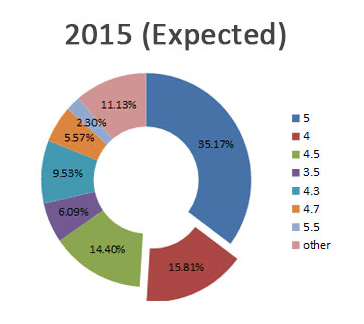 5.5-inch display on the other hand, was found on 2.83% devices in 2013, 6.53% in 2014 and is expected to have 9.53% share in 2015. The 4-inch display and its variations including 4.5-, 4.3- and 4.7-inch were found on 41.04% handsets in 2013, 41.08% in 2014 and will fall to 38.08% in 2015. Display resolution is another important factor to consider, as with the advent of full touchscreen handsets visuals are a key decisive factor. In 2013, the resolutions of 800 X 480 Pixel and 854 X 480 Pixel were most popular with 41.51% share of smartphone populace. In 2014, the number fell to 39.73% and is expected to fall further to 25.51%. This downward slump in the trend owes to increase in size of the display over years. 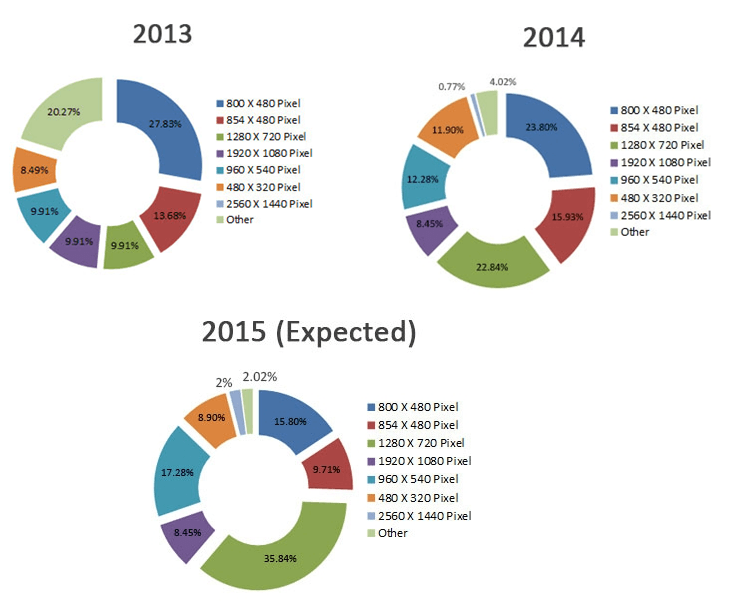 The resolution of 1280 X 720 Pixel is one of the most popular now a days, which rose to 22.84% in 2014 from 9.91% in 2013. It is expected to rise further to 35.84% in 2015. With the fierce competition and display technology being improved with the passage of time, the resolution is only expected to get higher. It was once considered a novelty to own a handset that features a camera, however, now days a camera is must in every handset and real war is of the resolution. Some of the popular and most common camera resolutions found on smartphones are 5 Megapixels, 8 Megapixels and 13 Megapixels. These resolutions were found on 24.53%, 31.60% and 8.96% handsets, respectively. 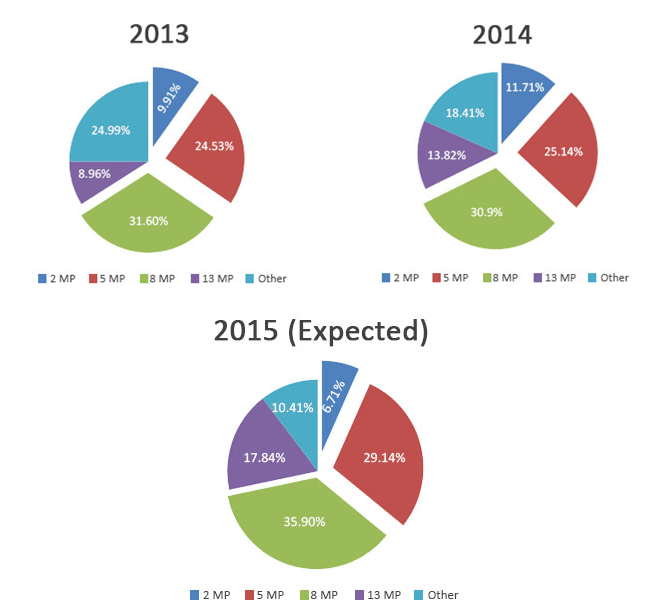 These numbers swelled to 25.14%, 30.9% and 13.82 in 2014. It is expected that 29.14% of handsets in 2015 will sport 5 Megapixel cameras, 35.90% will sport 8 Megapixel and 17.84% will come with 13 Megapixel snapper. The year 2014 witnessed emergence of 16 Megapixels and 21 Megapixel as well as Ultra pixel cameras and it is expected that the camera resolution if anything will only get better from here on. The front camera on the smartphone has never been a key decisive factor until 2014, when the selfie craze took the world by storm. Up until 2013, front cameras had one and one purpose only and that was video calling. This is the reason why 64.62% handsets in 2013 featured lower than 1 Megapixel front camera, which reduced to 52.58% in 2014 and is expected to go down to 40.61% in 2015. Around 29.24% of handsets featured 1.3 and 2 Megapixel front cameras in 2013, while 33.01% handsets feature the same in 2014. This bloom was owing to the emergence of budget segment smartphones in India. This is expected to go up to 39.01% in 2015. Now a days, 5 Megapixel front camera is a norm on smartphones that featured only on 4.72% handsets in 2013, rose to 12.28% handsets in 2015 and will continue to rise to 15.28% in 2015. Some handsets are being offered with an 8 Megapixel front camera as well that featured on 1.42% devices in 2013, 2.11% in 2014 and will rise to 5.10% in 2015. Processors are the lifeline of any device and are a decisive factor while buying any smartphone. A couple of years back, single core processor with a GHz of speed was considered to be a novelty. However, with time, smartphones have evolved and today we have Octa-core processor wielding handsets in under INR10,000. So fierce is the competition that a Quad-core processor is now considered to be a standard in budget handsets. Back in 2013, dual-core smartphones were on the rise as the concept was just introduced and it enjoyed a share of 47.17%. In 2014, the share shrunk to 35.12% with the advent of Quad-core processors and it is further expected to dip further to 20.12% in 2015. Quad-core processors, which were only found on high-end [p2p type=”slug” value=”transparent-smartphone-your-future-smartphone”]smartphones[/p2p] in 2013, enjoyed a share of 33.02% that raised to 47.98% in 2014 with more and more handset manufacturer offering the same. 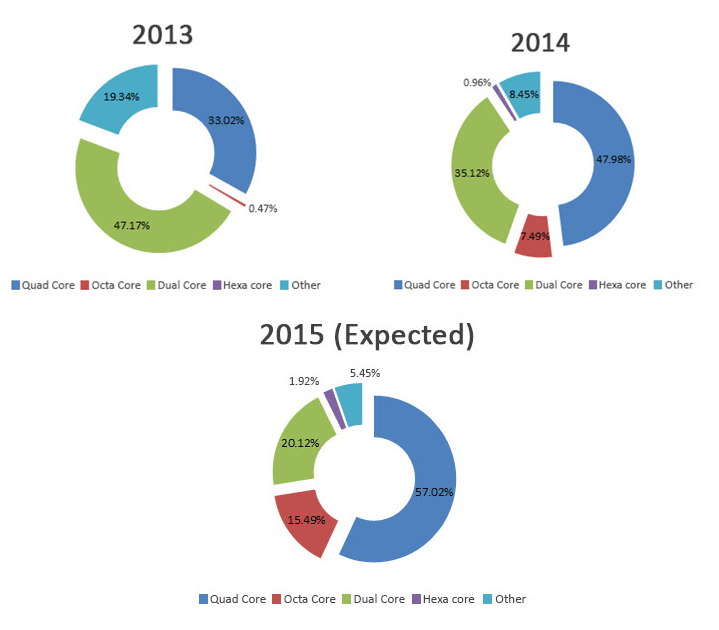 The idea of an Octa-core termed in the year 2013, where 0.47% smartphones were equipped with an Octa-core processor. Next year, in 2014 the number swelled to 7.49%. Now with Indian and handset manufacturers like Xiaomi and Intex among others, offering an Octa-core processor under INR 10,000 will only expand the reach to 15.49% in 2015. Other processors including single-core enjoyed a share of 19.34% in 2013, 8.45 in 2014 and is expected to slump to 5.45% in 2015. However, Hexa-core processors came into existence in 2014 with 0.96% smartphones sporting the same and it is expected to occupy 1.92% share in 2015. Having a fast processor is not the end of the line as it could not possibly deliver its full potential until and unless there is a dedicated memory for it to operate in. 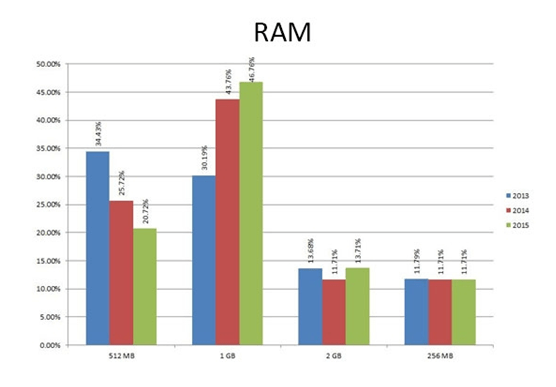 This is where the RAM comes into picture, lower the number of features, lower will be the RAM requirement. However, with the dynamics of technology constantly evolving and emergence of ground breaking features have increased the RAM requirement in the present day smartphones. In the year 2013, 256 MB and 512 MB of RAM were found on 46.22% of smartphones, which slumped to 37.43% in 2014 with the evolution of features. The number is further expected to slump to 32.43% in 2015. It was mandatory for Smartphone’s to have at least 1 GB of RAM to perform seamlessly and in 2013, 30.19% smartphones had a GB of RAM, in 2014 it was 43.76% and in 2015 it is expected to rise to 46.76%. Smartphone manufacturer also offered 2 GB of RAM on their high-end smartphones for a flawless and lag free performance. In 2013, 13.68% devices had 2 GB of RAM, in 2014 it was 11.71% and it is expected that 13.71% in 2015 will feature 2 GB of RAM. In the year 2013, Google’s Android operating system had the largest user base with 88.20% share, which only swelled up to 93.47 % in the year 2014. It is expected that the Android will continue dominating the smartphone segment in coming year as well with 93.47% share. This is owing to the fact that this operating system is open source and free for the handset manufacturers to use. Most top players like Samsung, HTC, Sony as well as emerging players like Intex, Lava and Karbonn among numerous other prefers Android. Next up was Windows operating system, which constituted a 5.18% of [p2p type=”slug” value=”manage-business-smartphone”]smartphone populace[/p2p] in the year 2013 and went down to 2.69% in 2014. The Microsoft-owned OS is further expected to slump further to 2.68% in 2015. As of now, the only significant Windows OS based handsets belong to Microsoft Lumia line-up. The US-based giant is trying to make amends as it has shook hands with local manufacturers like Micromax and Karbonn to launch Windows device. However, the operating system is in its nascent stage of re-emergence. The Cuppertino-based Apple’s proprietary iOS remains exclusive to its iPhones and iPads, which are intended for premium class of customers. Given the limited user base of these devices, iOS enjoyed a limited 2.35% share of smartphone space in 2013, which came down to 1.15% in 2014. Apple iPhones and iPads are one of the most sophisticated devices on this planet and with the advancement in technologies; their prices are steadily on a rise. To illustrate, the iPhone 3Gs was launched in India with a starting price tag of INR 36,000 whereas, the iPhone 6 and iPhone 6+ launched this year bears a tag of INR 53,500 and INR 62,500, respectively. That is a significant bulge in the price of these devices from initial days and makes these devices quite exclusive. This could be the reason why iOS continues to go steady at 1.15% in the year 2015 as well. Another significant operating system in the market is Blackberry OS that enjoyed a share of 2.35% in the year 2013 and then slumped to 0.58% in 2014. The reason behind this could be the selective launches by the RIM, the parent company of Blackberry. Also, these handsets tend to come with a ridiculously high price tag, which put off most customers. Now with a single launch of Blackberry Classic lined up, it is safe to predict that that this OS will continue to enjoy the same share as that in the year 2014. Other operating systems like Symbian, Meego, Linux, Bada, Firefox and Sailfish enjoyed a share of 1.88% in the year 2013 with a jump to 2.11% in 2014. The swell in the share of this operating system can be credited to the fact that consumers now days are open to experimentation and are looking for a fresh user interface other than Android and iOS. Moreover, the fact that handset running on these operating systems are comparatively cheaper than their counterparts is a decisive factor. 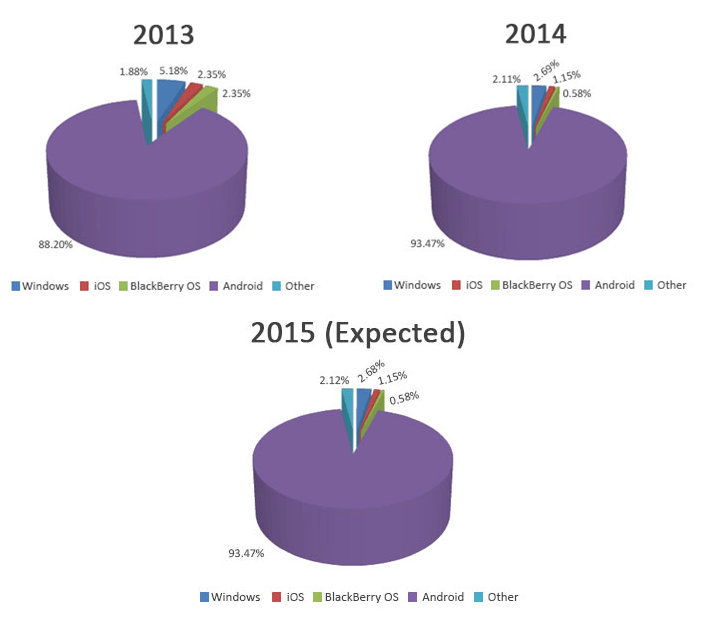 These operating systems are expected to enjoy a 2.70% share in the year 2015. Battery is also counted among one of the key features in a handset. In the year 2013, 51.42% handsets were equipped with 2000 or more than 2000 mAh battery and 2014 witnessed a slump with 47.22%. 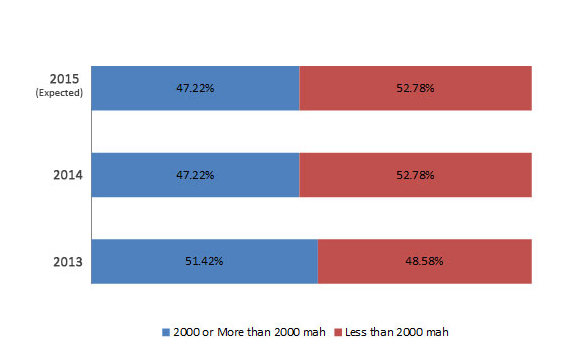 On the other hand, 48.58% handsets in 2013 featured less than 2000 mAh battery that rose to 52.78% in 2014. It is expected that the trend of 2014 will continue on to the upcoming year as well. The price of the handset is one of the major decisive factors while choosing a handset. 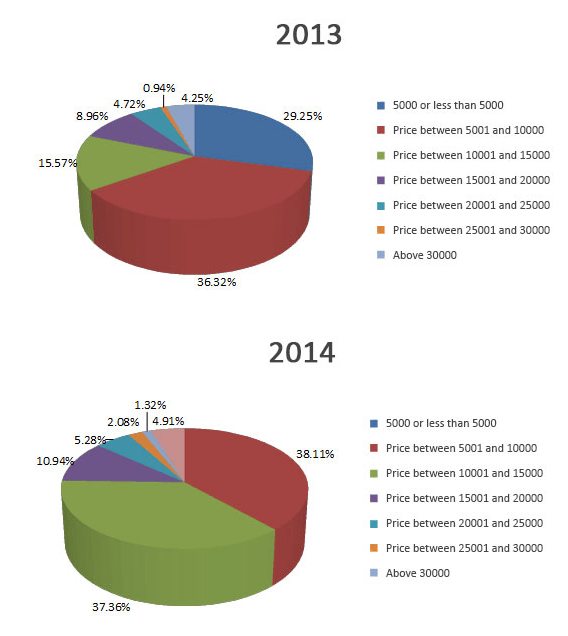 In 2013 and 2014, the price range from INR 5,000 or lesser was one of the most popular segments with 29.25% and 38.11% market share, respectively. 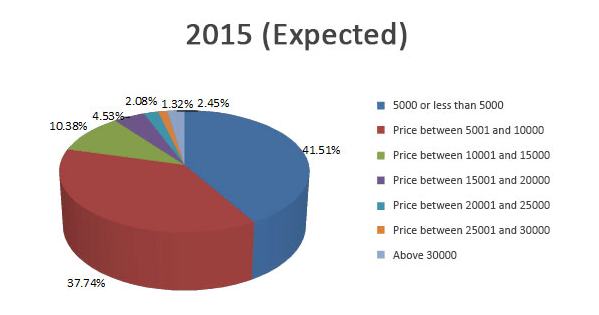 This particular price segment is expected to bump up to 41.51% in 2015. 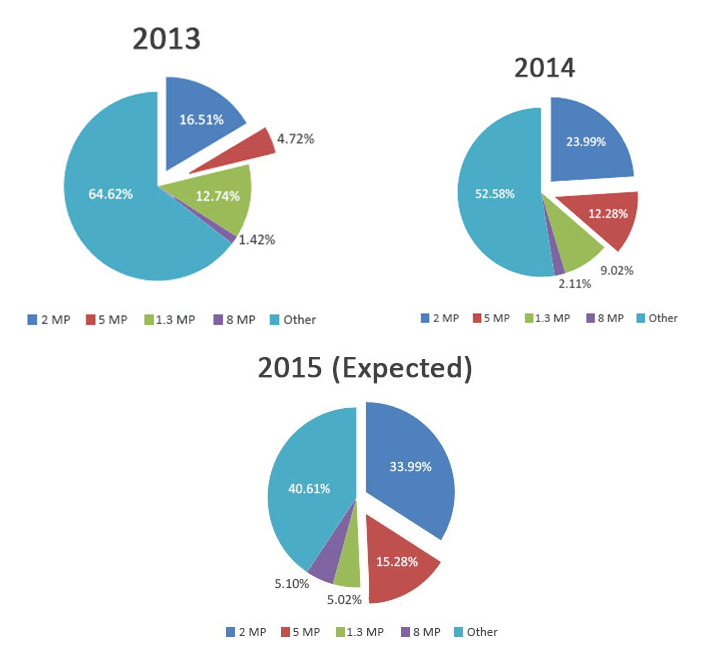 The INR 5,000 to INR 10,000 bracket was also the most popular segment with 36.32% and 37.36% share in 2013 and 2014, respectively. It is further expected to go steady at 37.74% in the year 2015 as well. Next popular segment was that of INR 10,001 – INR 15,000, which had a share of 15.57% and 10.94% in 2013 and 2014, respectively. It is expected to stay consistent at 10.38% in the next year as well. This trend is primarily due to major focus of handset manufacturers in India being budget segment. Brands like Xiaomi, Motorola, Asus and Micromax, among others have totally changed the dynamics of the industry. Besides, there is a speculation that Xiaomi is developing a sub INR 4,000 smartphone that is bound to intensify the market like never before.